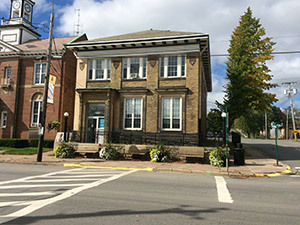 The Stellarton Public Library is located in the historic Bank of Nova Scotia building on Foord Street, and is next door to the Town Office. We offer a full range of free services and access to the resources of all Nova Scotia public libraries. Stellarton Library is a Community Access Program (CAP) site, sponsored by Nova Scotia Economic and Rural Development and Tourism. At the Stellarton Library you can access a wireless hotspot to high speed Internet. All library programs are offered free of charge, although space is limited - so please call the Library for more information, and to register 902-755-1638. We offer a special home-bound delivery service for Seniors, please call for details 902-755-1638. Find out what's happening at the Stellarton Library this fall.